It was December 1, 2014. The mild afternoon had turned into a chilly evening. A light rain was falling on the gritty sidewalks of the Upper West Side of Manhattan. PERFORMANCE BEGINS PROMPTLY AT 8:00 P.M. I took my seat on the aisle in the first row of the balcony. Next to me was my son, Brian. My wife, Mariam sat in the third seat. Great view of the stage, I thought. I posted a picture on Facebook of the unattended instruments on the stage. “8 minutes to go,” I wrote. At 8:10 the house lights went down and a gong-like tone rang from the large speakers. A guitarist stepped into the dark from stage right. A dark curtain behind the drums and pedal guitar parted. Four or five men walked out. One man wore a cream-colored suit and a planters hat with a black band. It was Dylan. The lights came up slightly and the crowd cheered with intensity. There is no need for a total recap of the songs. 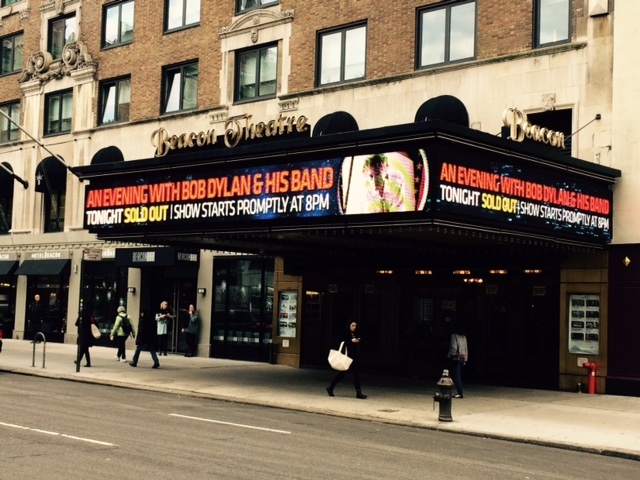 I knew that when the show ended, Bob himself wouldn’t make it out of the stage door before the set list for the evening was posted for the world to see on bobdylan.com. I’m not a music critic. I have nothing to offer in the way of commentary on chord changes, lyric alterations or technicalities. This was probably my 16th or 17th time I’ve seen Dylan in concert. The first: the early ’70’s when, backed by The Band, he filled Nassau Coliseum. I’ve seen him at Jones Beach in the heat of a summer’s night. I sat in Madison Square Garden at least twice and saw him once with Tom Petty and later with Paul Simon. I saw him at Roseland Ballroom when the audience stood for three hours. I was so close to the stage that I could see drops of sweat collect at the end of his reddish-blonde curls. It was at Roseland that I bent over to scratch my shin. I stood up and Neil Young and Bruce Springsteen were on stage with him. I last saw him in the summer of ’13 at the Saratoga Performing Arts Center. He seemed tired. The sound was poor and the stage was quite dark. Here was a hero of mine who, at the age of 73 was singing songs that helped define my own view of the world, relationships, life and death. There were three sublime moments that night. Three moments that rose up and flew to that place in my heart that taps a reservoir of memories and emotions. The First Moment came quickly and simply. Therein lies the power of that Moment. 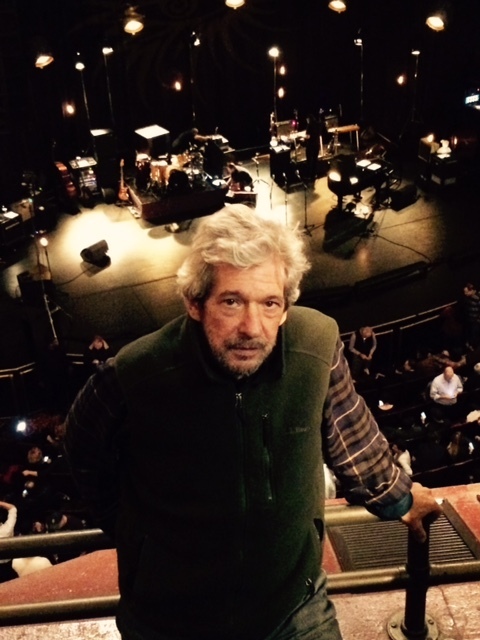 Early in the show Bob walks from the center stage microphones and sits at a baby grand piano. If you turned your head to say something you would have missed it. If your attention had wandered…you would have missed it. The audience had stopped cheering, the lights were down. Bob sat in a shadow at the key board. Then it happened. Her voice was not a GO BOB voice. It was quiet, almost pained…lonely and singular. It could have been the parting words of a heart-broken woman to her lover who has just walked out the door after gathering his blankets from the floor. The people near her heard her. I heard her. I wondered if Bob heard her. The moment was over in about six seconds and then the lights went up and he started a song. I felt overwhelmed by how she, speaking on an impulse, spoke for a billion people who listened to Bob for over 50 years. The Second Moment was during the first song of the encore. Signature riffs and chords did not announce the song. You listened to hear a recognizable phrase amid an altered version of the original piece. Written a thousand years ago but all about what happened in the last few minutes…somewhere. And, the Third Moment…it was NOT a Dylan song. But it worked and it was a perfect end to an emotional night. The words were written by Jerome Moross and Carolyn Leigh. I said good-bye to my son at the subway stop. Mariam and I walked back to where we were staying. We walked back in the drizzle. Christmas trees lined the sidewalks…over priced but smelling like our own backyard. That balsam scent stays with you. I miss my son already. I wanted his company. I wanted him to stay with me. My wife held my arm…my back was sore…she’ll stay with me. In a lifetime of good-byes and loss, death and divorce, aging and illness, graying hair and arthritis…it’s heartbreakingly comforting to know something and someone will stay with me.